Celery (Apium graveolens) is a marshland plant in the family Apiaceae that has been cultivated as a vegetable since antiquity. 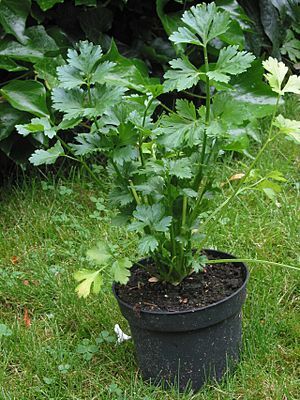 Celery has a long fibrous stalk tapering into leaves. Depending on location and cultivar, either its stalks, leaves, or hypocotyl are eaten and used in cooking. 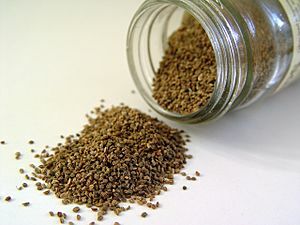 Celery seed is also used as a spice; its extracts are used in medicines. Harvesting occurs when the average size of celery in a field is marketable; due to extremely uniform crop growth, fields are harvested only once. The petioles and leaves are removed and harvested; celery is packed by size and quality (determined by colour, shape, straightness and thickness of petiole, stalk and midrib length and absence of disease, cracks, splits, insect damage and rot). During commercial harvesting, celery is packaged into cartons which contain between 36 and 48 stalks and weigh up to 60 pounds. Under optimal conditions, celery can be stored for up to seven weeks between 0 to 2 °C (32 to 36 °F). Inner stalks may continue growing if kept at temperatures above 0 °C (32 °F). Shelf life can be extended by packaging celery in anti-fogging, micro-perforated shrink wrap. Freshly cut petioles of celery are prone to decay, which can be prevented or reduced through the use of sharp blades during processing, gentle handling, and proper sanitation. Celery is eaten around the world as a vegetable. In North America the crisp petiole (leaf stalk) is used. In Europe the hypocotyl is used as a root vegetable. The leaves are strongly flavoured and are used less often, either as a flavouring in soups and stews or as a dried herb. Celery, onions, and bell peppers are the "holy trinity" of Louisiana Creole and Cajun cuisine. Celery, onions, and carrots make up the French mirepoix, often used as a base for sauces and soups. Celery is a staple in many soups, such as chicken noodle soup. In temperate countries, celery is also grown for its seeds. Actually very small fruit, these "seeds" yield a valuable volatile oil used in the perfume and pharmaceutical industries. They contain an organic compound called apiole. Celery seeds can be used as flavouring or spice, either as whole seeds or ground. The seeds can be ground and mixed with salt, to produce celery salt. 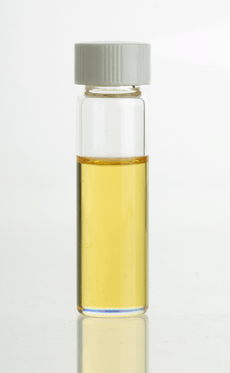 Celery salt can be made from an extract of the roots or using dried leaves. Celery salt is used as a seasoning, in cocktails (notably to enhance the flavour of Bloody Mary cocktails), on the Chicago-style hot dog, and in Old Bay Seasoning. The use of celery seed in pills for relieving pain was described by Aulus Cornelius Celsus around AD 30. Celery seeds contain a compound, 3-n-butylphthalide, that has been demonstrated to lower blood pressure in rats. Celery juice significantly reduced hypertension in 87.5% of patients (14 of 16) tested. Another study showed the same effect on hypertension associated with pregnancy. Selinunte didrachm coin bearing a selinon (celery) leaf, circa 515-470 BC. Apium illustration from Barbarus Apuleius' Herbarium, c. 1400. Celery Facts for Kids. Kiddle Encyclopedia.